Home » GRINNELL, GEORGE B.
Grinnell, an avid naturalist, explored parts of the west and midwest. In 1886, he founded the Audubon Society and, in 1887, along with Theodore Roosevelt, founded an organization of sportsmen and conservationists sharing, for many years, the editorship of the organization's publication with Roosevelt. Glacier National Park was created largely through Grinnell's efforts and, in 1925, he was awarded the Roosevelt gold medal of honor and was elected President of the National Parks Association. He was on numerous advisory boards and committees dealing with conservation issues, and author of many books. 1882, New York. 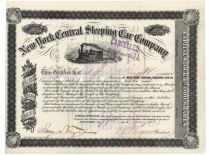 Stock certificate for sixteen shares. Issued to but not signed by George B. Grinnell (1849-1938). Grinnell was a naturalist, conversationalist, editor and author. Black. Vignette to stop center of passenger train. Stamp and punch cancelled. Very fine.